WaveFront Technology, Inc. (WFT) utilizes a state-of-the-art continuous UV casting process to manufacture Fresnel lens, diffractive, holographic and hybrid (combination) films for both stock and custom specialty films in roll format sizes from 6” to 68” wide. Typically these films are laminated to paper or board and sheeted for use in lithographic, offset and flexographic printing systems. 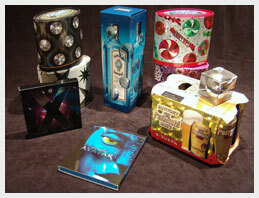 The printed sheets are then die-cut and utilized for a variety of product packaging including the DVD/Blu-ray, Liquor, Cosmetic and specialty product markets. WFT is responsible for most of the recent innovations in packaging films combining prismatic (Fresnel) structures with holographic patterns in custom design shapes to yield the most creative custom packaging films available. Packaging designers integrate the dynamic 3D lensing and holographic effects of WFT film to enhance the look and ‘movement’ of the final package. WFT has their own Diamond Turning Machine (DTM) Lab that has innovated ‘thin’ Fresnel designs that optimize lamination and printing. WFT’s DTM Lab has developed the largest library of Fresnel lens masters available in the industry today and continues to build on this capability. Custom pattern designs can be made bright or subtle, and very dimensional. These designs have been utilized on high volume consumer packaging products such as holiday season tissue cartons, cosmetic packaging and beverage cartons, as well as video games and recent blockbuster DVD/Blu-ray releases. WFT has been working with the leading packaging designers in the U.S., Europe and Asia for since 2005 and has mastered the art of combining lensing, diffractive and holographic patterns to enhance the printing artwork. Some of our most recent collaborations have won international awards for innovation and appeal. Fresnel lens structures are placed behind specific areas of a graphic to add depth and ‘movement’ to the artwork and holographic patterns are added to areas where rainbow color and sparkle are desired. When used for decorative purposes such as point-of-purchase (POP) displays, product displays, or product packaging, our patterns have an appeal that brings the illusion of 3D with eye-catching movement. The benefit of a Fresnel lens used in a package is that it images the area in which the package is displayed so if you were standing in the isle of a store and someone walks between you and the package, the package will appear to have movement even when you are standing still which catches your eye and draws you to the package. With so many brands vying for the opportunity to attract consumers to their products, the demand for innovation to enhance packaging design is always at the forefront of their concerns. The ability to create “Pop” or the “Wow Factor” for packaging design projects has allowed WFT to build a tremendous amount of credibility within the packaging industry. WFT has established itself as the “go to” company for producing innovative and custom designs.